If you’ve been keeping up to date with Windows 7 news then you’ll know that Microsoft is encouraging users to customize their log on screen. They are giving users links, on facebook, to programs that make it easy. 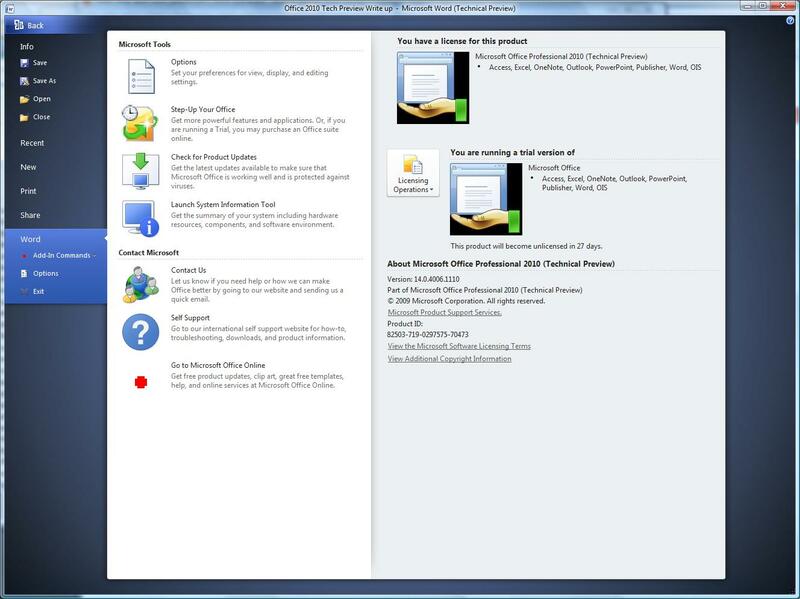 Download this program, extract the zip, launch the program and customize away! Windows 7 is here, well for people lucky enough to be part of a group that receives the RTM before October 22nd –people like me. It may seem like yesterday when Microsoft introduced Windows Vista (three years actually), so it makes you wonder –is 7 worth upgrading to? The short answer is yes. The install is much quicker than the beta or RC. I thought about using a flash drive but I ended up not being able to find one, so I used a DVD . I formatted my drives, designated a primary drive and clicked install. From there it was just click, click, done. It took about 20-25 minutes to install windows, with another 30 minutes to install all the drivers for my hardware. Compatibility wise Windows 7 is right where it belongs -compatible. Believe it or not, the fact that 7 is compatible with current hardware is all thanks to Vista. If you have drivers that work in Vista they’ll most likely work in 7. Even XP drivers work, thanks to the compatibility feature –which is also present in Vista. I was caught off guard when I wanted to install Intel x58 drivers; Vista has to install about 30 drivers, 7 on the other hand only needs two. Microsoft tweaked the UI scheduler a lot in order to make 7 more responsive. Vista implements a modified XP UI scheduler, which works fine –in XP, but Vista’s UI upgrades overburden it. Windows 7 has moved away from the old scheduler to a model employing division of labor. Instead of having one scheduler juggling all the UI I/O there are several which are prioritized in the OS. There is not much to add that hasn’t been said. 7 definitely is on the right track, the only problem I see are the “I am a Mac” commercials –I don’t think they’ll work anymore. Bummer. Yes I know this is a very short post considering I am posting about Windows 7. However, chances are you’ve hit Engadget or Gizmodo before arriving here and you’ve read their reviews. In the middle of the night I had the genius idea to test my Seagate 320GB hard drive using HD tune while running Vista and Windows 7. When I first got this drive, 2007 I think, it was a pretty good drive compared to the competition. I bought it on sale at Best Buy for $59.95, which if you ask me was a pretty damn good deal. I regret not buying two to run a raid, but that’s in the past. HD Tune was run three times on each operating system; out of those three I took the best results for each OS. No programs ran in the foreground while HD Tune was running. However, I will say that I don’t know how many programs ran in background of each OS. Where do I begin? First of all the drive is pretty sporadic. 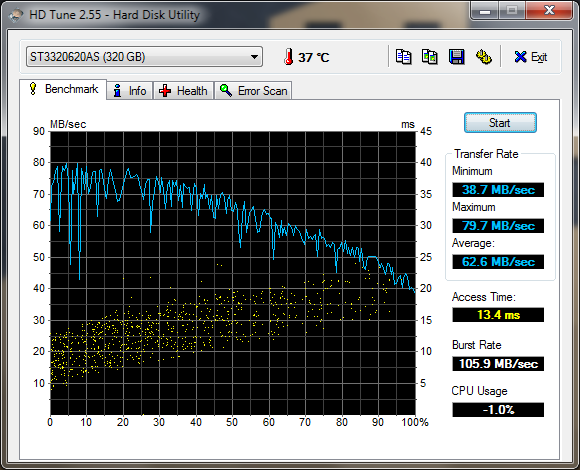 I am no hard drive expert but even I know that the drives constant change in transfer rate isn’t good. 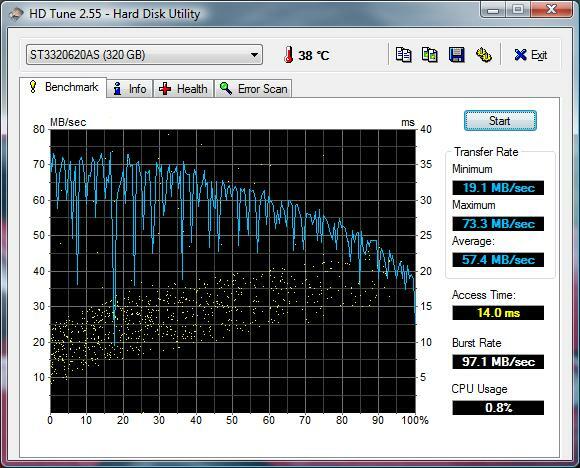 As you can see at about 18% transfer rate takes a nose dive from a pretty solid 73 MB/s to 19 MB/s. The average speed isn’t too impressive at 57.4 MB/s. I’ve seen reviews of 7500RPM drives with average transfer rates of 90+MB/s. Though, the drives I’ve seen that on are much newer and have twice the cache, 32mb compared to the Seagate’s 16mb. At 14ms I wonder what the drive is doing besides seeking and placing the arm. But, not all is lost. Considering the other numbers I’d say the Burst Rate is pretty solid for a disk drive, 97.1 MB/s is acceptable. The world has turned on its axis and magic has happened, babies have been made, people found out babies have been made. I’ve wiped the computer installed Windows 7 RC Ultimate x64, slapped on programs and added some other stuff. After adding updates, fixing drivers (damn you AudioMAX driver), and web surfing, I downloaded the same HD Tune that I ran on the Vista install. It seems Windows 7 made such a huge difference that I could have run HD Tune without a CPU. The CPU usage is -1.0%, I take it less than no CPU was used at the moment the test ran. I’ll be honest and say I have no idea what that’s about, I assume the API for CPU usage is slightly different between Vista and 7. The minimum transfer rate on Windows 7 is much higher than on Vista. While running the test on Vista I got 19MB/s, 7 got 38.7MB/s. You’ll also notice the maximum transfer rate is slightly higher, but not by much. On Vista the maximum rate was 73.3, 7 managed to push it to 79.7MB/s. The Burst Rate is up by almost 10MB/s, that’s two decent quality mp3 per second. If you ask me that’s quite a jump. The change even decreased the access time from 14ms to 13.4, which really isn’t that much, it’s not even noticeable to a human, but it makes a difference to computers. I don’t know how the access time went down, considering I didn’t change the motor of the drive or tweak it physically. My only guess is that Windows 7 handles file location handling differently than Vista. To be honest I didn’t expect a different OS to make a difference. I don’t know how HD Tune tests the drive, if it uses OS specifications or if it has its own. 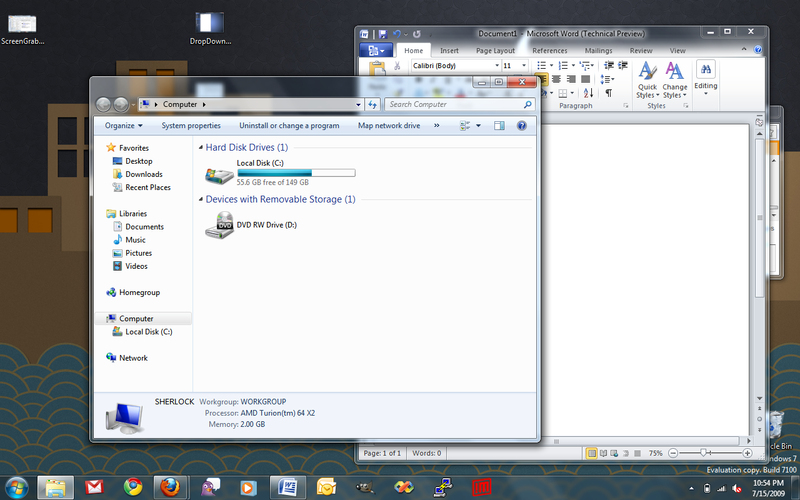 Whatever Microsoft has done under the hood to tweak file transfer handling in Windows 7 has really paid off. I am really curious if there have been more tweaks between the RC and RTM. For now I’d see file transfer handling is another area 7 bests Vista in. It seems this test went from hard drive performance on different operating systems to file handling. You can take what you want from this article; I’ll take it as another reason why I can’t wait for Windows 7’s final release. Until then. Good night and good fight. First they gave us SMS on GTalk. Then they took it away. Now, they’ve given it back. What’s the deal Google? You think you’re funny? Well, you are -sometimes. But not this time! Good thing Google is a search engine/software giant. I don’t think it would make it far as a stand up comic. 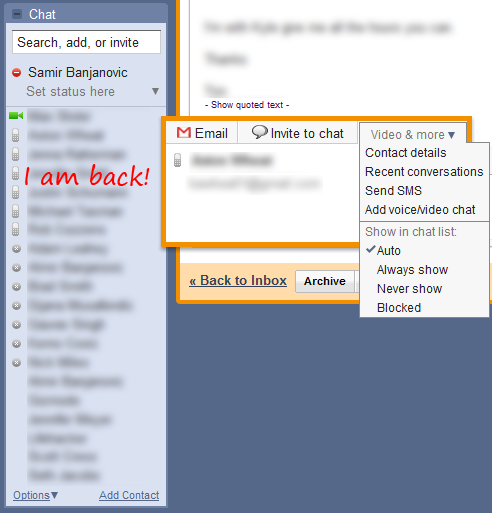 I don’t how Google is rolling out the return of the SMS feature, but I know mine is back. Let me know if yours is. You can tell right off the bat that Microsoft wanted to keep the design simple. 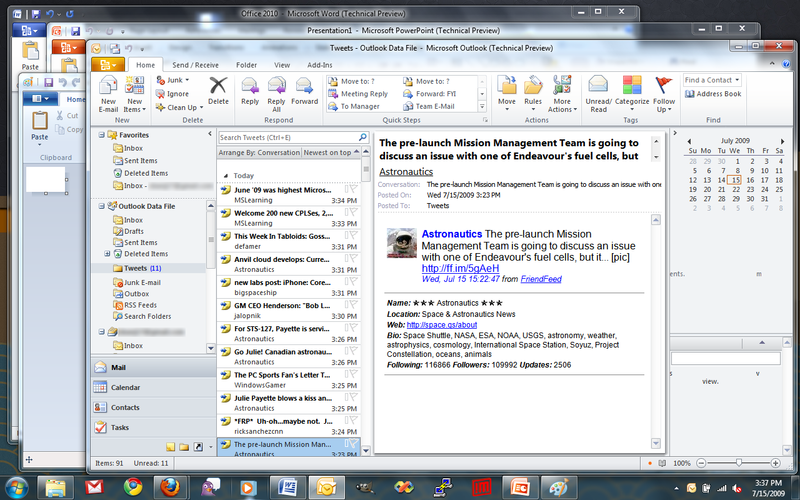 Most of it is based on a light color theme, which goes very well with Windows 7. Microsoft has taken the ribbon and expended on it to make it easier to navigate. 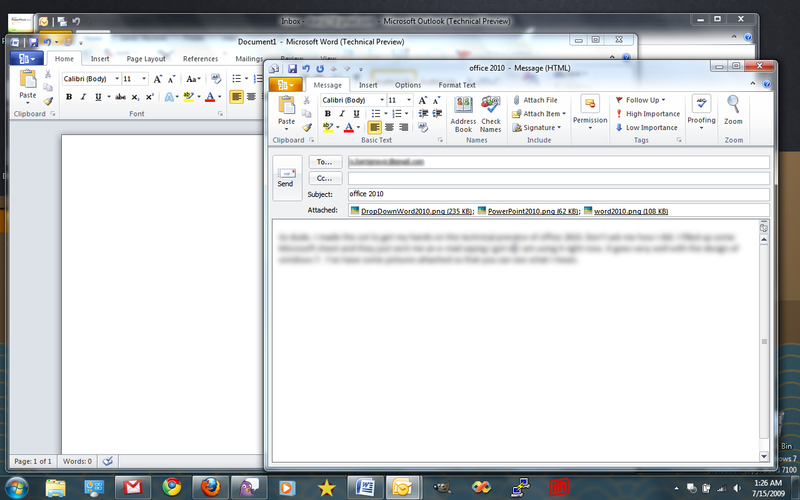 Somehow, I don’t know how (yet), Microsoft has reduced the size of the ribbons but made them easier to navigate. They are still arranged the same as in 2007, so there’s no worrying on migrating to 2010. We weren’t only introduced to the ribbons in 2007, we also met Microsoft’s new menu orb. The orb essentially contained all the options that “File” used to contain in the menu strip. In 2010 Microsoft took the orb to the next level, it’s not an orb anymore for one, and made it more of an Awesome Recorb (Orb turned into rectangle). 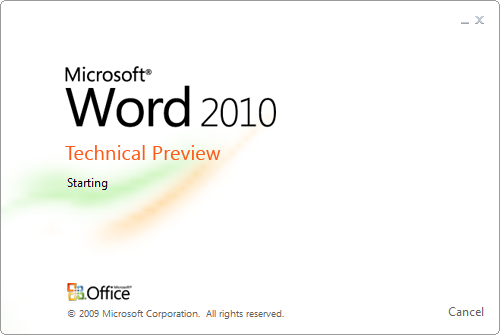 Office 2010 takes all the File menu options and breaks them down into categorical grouping. I can see why Microsoft has done this; it makes the menu very clean and simple to navigate. Relevant information and links are presented first, for more advance options you simple chose “Options.” The whole design reminds me of the Control Panel categorical grouping option. This new set up works very well, it brings order to the former mayhem. With work and life on the side I’ve not had much time to test the entire office suite, but with classes starting soon I am sure I’ll be using 2010 on a daily basis.